Mrs. Seema Al Langawi is a consultant with the Land and Property Management sector of the Department of Municipal Affairs in the Government of Abu Dhabi. Besides her PHD at the Civil Engineering and Science College at the University of Newcastle, Mrs. Al Langawi holds honorary positions as a survey engineer and property expert in the Court of Justice of the State of Bahrain and in the Gulf Coordination Council Commercial Arbitration Centre. 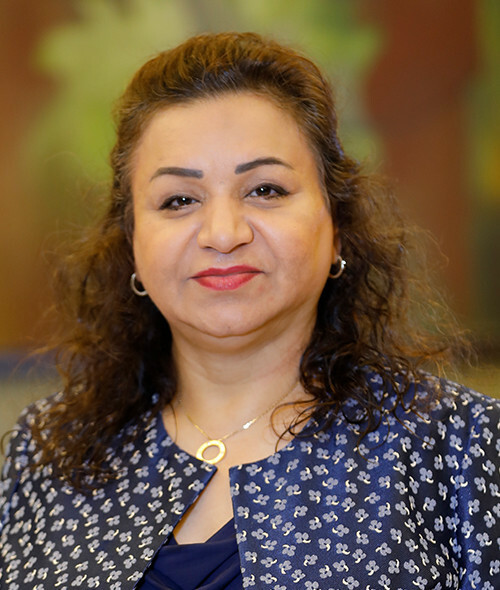 Seema Al Langawi is also member of many professional associations including the Project Management Institute, the International Cartographic Association, the Bahrain Society of Engineers and the Women’s Union of Bahrain. She has a Master’s degree in Geographic and Geodetic Information Systems (GIS) from the University College London, a post graduate diploma in Automated Cartography from the International Institute for Aerospace Survey and Earth Science, ITC, Netherlands, and a Survey Engineering graduate degree from the University of Baghdad.